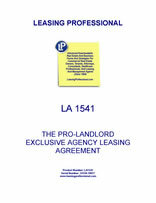 allows the owner to sell the property free from the effect of the agreement if the landlord elects to do so. This Agreement is made as of the ____ day of 20__ by and between ______________ whose address is ____________________________________ (hereinafter referred to as “Agent”) and ___________________ whose address is _______________________________ (hereinafter referred to as “Owner”). 1. Agency. In consideration of Agent agreeing to use its best efforts in the leasing of the property described below, Owner hereby agrees to employ Agent as exclusive agent with the right to lease such property subject to the following terms and conditions. 4. Term. This Agreement shall become effective upon _______________________ and shall terminate at mid­night on _______________________, unless sooner terminated as provided herein. 5. Cancellation. Either party may cancel and terminate this Agreement upon not less than ten (10) days prior written notice to the other party in the event of a material default hereunder by such other party which is not cured within such ten (10) day period. In addition, Owner may elect at any time, without cause, to cancel and terminate this Agreement upon not less than ten (10) days prior written notice to Agent. If, within ___________ days after termination of this Agreement Owner executes any lease of the Property with a party with whom Agent had negotiated for such lease prior to termination of this Agreement, Owner shall pay to Agent a leasing commission hereunder for such lease if, and only if each of the following conditions have been met: First, Agent shall have delivered to Owner on or before the date of termination of this Agreement a list of all parties with whom Agent conducted negotiations prior to termination of this Agreement; second, the list contains the name(s) of the party or parties entering into such lease; and third, Agent, upon request of Owner, substantiates its negotiations with the party or parties in question in writing.